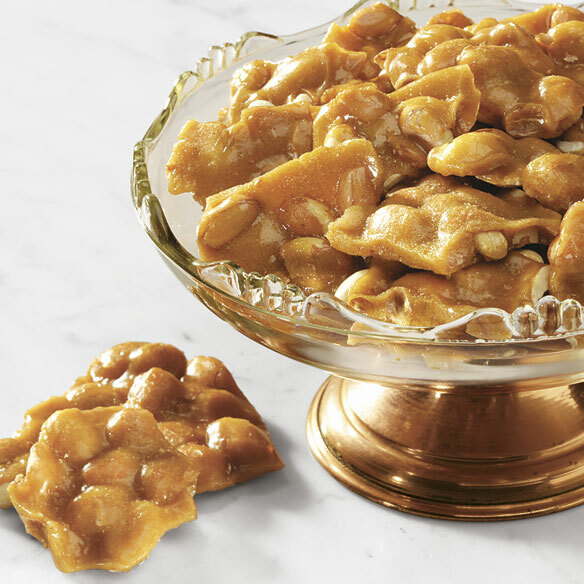 Crunchy, buttery, and brimming with freshly roasted peanuts, this sugar free peanut brittle is a savory treat made from an old-world recipe created in 1916. Cooked in copper kettles, the texture and taste are simply exceptional. Sweetened with Maltitol and packed in a copper colored tin, this sugar free peanut brittle gift is perfect for sharing. 2"H x 6 1/2" dia. ; 12 oz. Maltitol Syrup, Peanuts, Coconut Oil, Butter (Cream [Milk], Salt), Sodium Bicarbonate, Peanut Oil, Soy Lecithin (an emulsifier), Caramel Color. Sugar Free Peanut Brittle Tin Nutritional Information: Serving Size 1.06 oz. Amount Per serving: Calories 140, Calories from Fat 80. Total Fat 9, 13%; Saturated Fat 5g, 24%, Trans Fat, 0g; Cholesterol 0mg, 0%; Sodium 40mg, 2%; Total Carbohydrates 18g, 6%; Dietary Fiber <1g, 3%; Sugars 0g, Sugar Alcohol 17g; Protein 2g; Vitamin A 0%, Vitamin C 0%; Calcium 0%; Iron 0%. I have been having a little at a time but the taste and texture is very good for sugar free. I enjoyed what I have had and my daughter who DOES NOT like sugar free absolutely loved it!! gave this as a gift, for artifical sweetened is very good.. my son loved it. May I have another please, and another.. I tried to make it last longer but I just had to keep going back for another chunk! It felt good to know I did not have to enter more grams of carb in my insulin pump than this required. It did not make my blood sugar soar. I want more! This time I am ordering two tins! I did not feel I had to sacrifice any flavor or texture by not having the "real thing". It was a snack and was very good. My husband, who suffers with type II diabetes, was actually thrilled, when I presented him with the little tin of sugar-free peanut brittle. The look of pure pleasure was worth the high price. When I saw this I had to get it for my diabetic grandma. It will be a wonderful surprise for her. Peanut brittle and not upset her dentist. Peanut brittle is a favorite, but hard to find sugar-free. My husband is diabetic and likes peanut brittle. Yours satisfies his sweet tooth. I wish it was more readily available. It has lots of peanuts which is really nice and great crunch but very little taste. I'm not sure what I expected for a sugar free product. I have had sugar free peanut brittle that is easy to chew, but this is extremely hard. In both my orders, the peanut brittle was all stuck together in one large lump. I live in Texas and the containers probably get way too hot during delivery. I have in previous orders, bought this same product and found it to be very good and easy to break apart. The last order was a big disappointment, when I opened the container it was one very large chunk of peanut brittle and it was like it had yet been allowed to spread out and broken into small bit size pieces. I had to resort to a small chisel and hammer to break it into bit size pieces so I could enjoy what I had in other orders. For this reason I am waiting until very cold weather to reorder what was my favorite sugar free peanut brittle. Because of your request not to use other retailers by name, lets just say I not have to buy a less tasting brittle until I am sure the weather will not give me your product in one very large chunk. Brittle but it was so hard that you couldn't break it apart to even try to eat it. Stocking up on sugar-free candy. I'm diabetic and love peanut brittle. I've never seen sugar free before. My husband is diabetic and enjoys this sugar free peanut brittle, especially during the holidays. Dad's birthday. He is diabetic. It was sugar free - dictate from dentist when ordering snacks. l love good tasting candy! Sister is diabetic and had recently had surgery on foot. I love peanut brittle but I can't have the sugar. I hope this is a nice alternative. Too many merchants choose not to make a concerted effort to please elderly (and some not so elderly) who are diabetics. I am most appreciative of the opportunity to make these purchases. I wish you had more varieties to choose from. Can your supplier of sugar free items be contacted directly? Thanks. First time buy. Wanted to try.